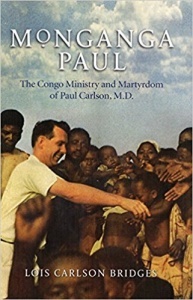 In 1964, Dr. Paul Carlson, a medical missionary with the Evangelical Covenant Church, was killed while serving in the Democratic Republic of Congo. Shortly after, Paul Carlson Partnership was created in his honor to continue his work in partnership with the Covenant Church of Congo. 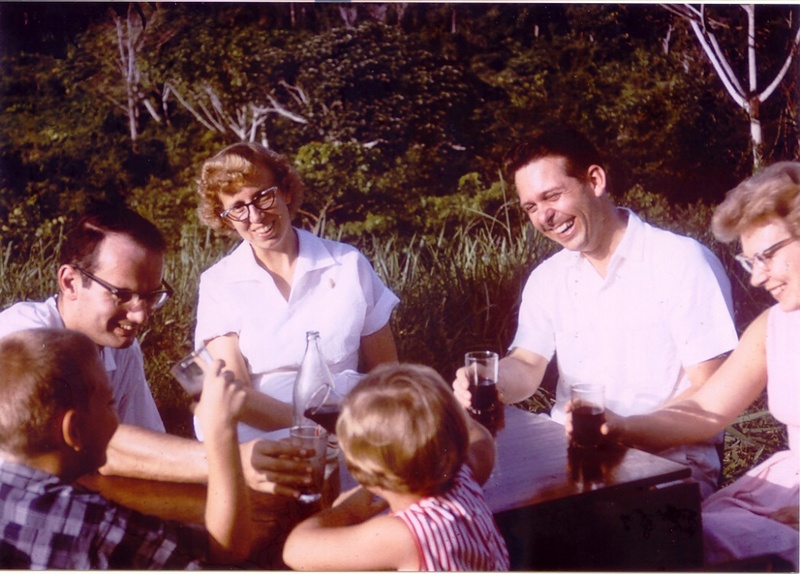 The Carlson family plus two medical colleagues to the left, at home in Congo. Unfortunately, Carlson picked a bad time to do good work. In the early fall of 1964, the political situation in the region was deteriorating. 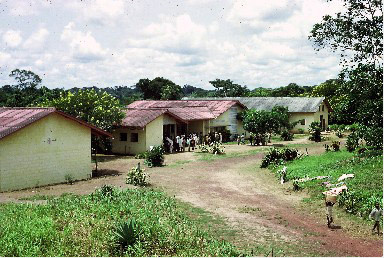 Carlson became sufficiently concerned that he moved his wife, Lois, and their two children across the Ubangi River to the Central African Republic. He, however, returned to his post, hoping to stay as long as possible to minister to his patients. Carlson was betting that the rebels would not bother doctors, but he had contingency plans to join his family if the situation became more violent. “He worried that if he left, the rebels would come in and kill all the patients,” remembers Wayne. Sadly, he bet wrong. In September, Dr. Paul was arrested, then tortured physically and mentally. He was sent 300 miles south to Stanleyville where he became a pawn of the Simba rebels. 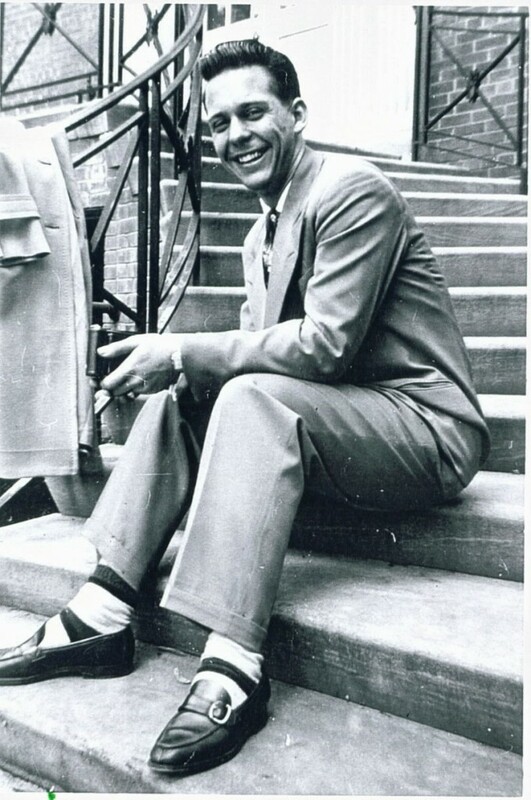 They repeatedly sentenced him to death as an American spy, sparing him whenever they thought they were about to win concessions from the Belgian and American governments, which opposed their activities. Carlson’s worried family spent their days listening to shortwave radio, praying for word of his safety. As morning dawned in Stanleyville on November 24, 1964, however, the American and Belgian governments decreed there would be no more concessions. The savage rhetoric from the rebel leadership prompted the Americans and Belgians to launch a rescue mission. U.S. airplanes droned overhead as Belgian paratroopers dropped down on the outskirts of town. The rebels were anxious and full of adrenaline. And then Carlson’s final ordeal began. The brutal Simbas routinely killed and tortured their enemies, sometimes consuming the dead prisoners’ organs in front of others. With the paratroopers approaching that morning, the rebels assembled the Stanleyville prisoners in the street. They put women and children in the front rows. Crazed with fear and anger, the Simbas began chanting “kill” in Swahili. What followed was a nightmare. A Simba guard opened fire on a woman, emptying his rifle into her bleeding body. Other soldiers fired blindly into the crowd, targeting parents who had flung their bodies over children. Some prisoners feigned death. Carlson and others at the rear of the group ran toward a wall, hoping to leap to safety. But before trying to scale the wall, Carlson urged another prisoner, a missionary as well, to go first. As Carlson climbed, he was sprayed with machine gun fire and fell to the ground. Belgian paratroopers arrived at the scene shortly after Carlson was killed, and the rebels fled. A photo of the young, clean-cut missionary with unseeing eyes, an ID tag looped around his neck, soon was seen around the world. It was taken only minutes after his death, as he lay in a field of casualties. 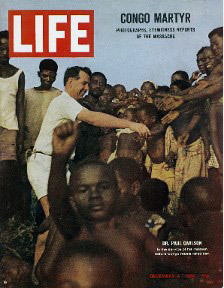 In the following weeks, Carlson’s photograph was featured on the cover of Time magazine, and his story would become a riveting tale of martyrdom from the turbulent Congo. In the last tape Carlson dictated and sent home before his arrest, Dr. Paul clearly had no simplistic view of his mission. Paul Carlson’s friends and family still speak lovingly of an apolitical man who sought no fame or fortune. Carlson was heroic, not because of his martyr’s death, but because he was committed, against all odds, to healing others. In the New Testament he carried with him, Carlson had written the date and a single word the day before he died. The word? Peace. Monganga Paul is the electrifying story of Christian heroism that caught the world’s imagination when first published in 1965 – the story of a California surgeon who took his family into the remote jungle of Congo to care for the sick and needy, only to be gunned down after being falsely accused of being a spy. The horror of Dr. Paul Carlson’s death on November 24, 1964, during a rescue attempt in Kisangani (then Stanleyville), evoked shocked reactions around the world. Lois Carlson Bridges, Paul’s widow, traces the impact of his faith as he sought direction for his life, and the struggle the couple faced in choosing a life of hardship over the alluring of a wealthy suburban medical practice. 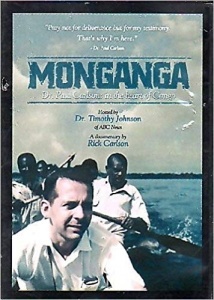 This 54 minute documentary film tells the story of Dr. Paul Carlson, a medical missionary to the Democratic Republic of Congo, who was killed in 1964. A free copy is available by request. Please contact us at (773) 907-3302 or email us to request a copy of this film. Read the famous article about Dr. Paul Carlson’s life and death, published in Life Magazine in 1964. The Democratic Republic of Congo currently ranks among the world’s most failed nation-states. 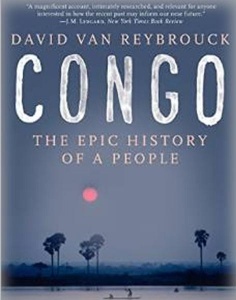 Congo: The Epic History of a People traces the history of this devastated nation from the beginnings of the slave trade through colonization, to the struggle for independence and Mobutu’s brutal three decades of rule. David Van Reybrouck ends with the civil war that has raged from 1996 to the present day—the deadliest since World War II. In the 1880s, as the European powers were carving up Africa, King Leopold II of Belgium seized for himself the vast and mostly unexplored territory surrounding the Congo River. Carrying out a genocidal plundering of the Congo, he looted its rubber, brutalized its people, and ultimately slashed its population by ten million–all the while shrewdly cultivating his reputation as a great humanitarian. Heroic efforts to expose these crimes eventually led to the first great human rights movement of the twentieth century, in which everyone from Mark Twain to the Archbishop of Canterbury participated. 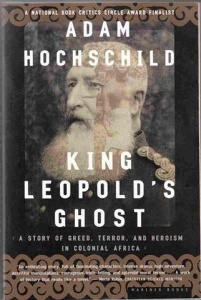 King Leopold’s Ghost is the haunting account of a megalomaniac of monstrous proportions, a man as cunning, charming, and cruel as any of the great Shakespearean villains. It is also the deeply moving portrait of those who fought Leopold: a brave handful of missionaries, travelers, and young idealists who went to Africa for work or adventure and unexpectedly found themselves witnesses to a holocaust.